Market Movers Asia, Apr 8-12: China’s crude oil import data and Asia’s appetite for Colombian thermal coal. Watch: Market Movers Asia, Apr 8-12: China’s crude oil import data and Asia’s appetite for Colombian thermal coal. Markets expect the Platts JKM – the benchmark for LNG spot prices in North Asia - to remain under pressure despite the rebound in UK gas prices, with ample supply and tepid demand in the region. The arbitrage window to export Pacific cargoes to Europe remains shut and the supply overhang is likely to weigh down prices in Asia this week. India will announce its oil products demand numbers for March this week. The market will be looking for signals on whether India's gasoil demand have started to pick up ahead of the federal elections, when demand for commercial transportation normally goes up. China is expected to release its trade data for March this week. In which, crude imports could show a drop amid destocking activity and the ongoing maintenance season in the second quarter. China's crude oil imports have been hovering above 10 million b/d for four continuous months. Meanwhile, oil product exports are more likely to rebound. Supramax freight rates dropped lower last week and market participants expect the trend to continue in the coming week on the back of poor demand from coal cargoes within the Pacific. Availability of vessels has continued to increase and rates are headed towards being done on arrival pilot station or APS basis. 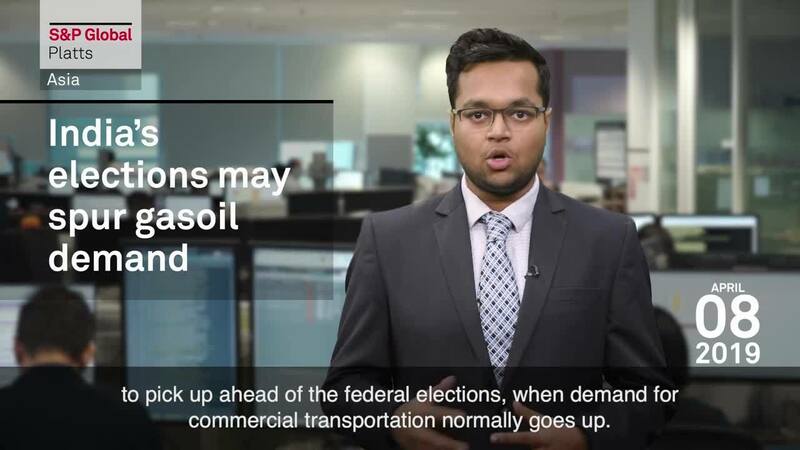 This week: eyes are on the impact of India's elections on gasoil prices, China's crude oil import data, the trend in Supramax freight rates, and Asia's appetite for Colombian thermal coal. But first, in LNG, markets expect the Platts JKM – the benchmark for LNG spot prices in North Asia - to remain under pressure despite the rebound in UK gas prices, with ample supply and tepid demand in the region. The arbitrage window to export Pacific cargoes to Europe remains shut and the supply overhang is likely to weigh down prices in Asia this week. So here's what we want you to tell us via Twitter with hashtag PlattsMM: Will Asian spot LNG prices remain de-linked from European gas prices this week? Now in oil, India will announce its oil products demand numbers for March this week. The market will be looking for signals on whether India's gasoil demand have started to pick up ahead of the federal elections, when demand for commercial transportation normally goes up. India's February oil demand rose 3.8% year on year to about 4.88 million b/d. Still in oil, China is expected to release its trade data for March this week. In which, crude imports could show a drop amid destocking activity and the ongoing maintenance season in the second quarter. China's crude oil imports have been hovering above 10 million b/d for four continuous months. Meanwhile, oil product exports are more likely to rebound. In February, China's gasoline exports fell to a 3-year low of 555,000 mt, while gasoil exports declined 18% month on month to 1.51 million mt. Moving to shipping, Supramax freight rates dropped lower last week and market participants expect the trend to continue in the coming week on the back of poor demand from coal cargoes within the Pacific. Availability of vessels has continued to increase and rates are headed towards being done on arrival pilot station or APS basis. And finally in coal, the market is waiting to see if Chinese buyers accept offers for Colombian thermal coal. Sellers are now trying to divert Colombian cargoes to Asian markets due to a slump in North West European coal prices. However, a 6% import tax and a 50-60 day voyage duration may put off Chinese buyers.